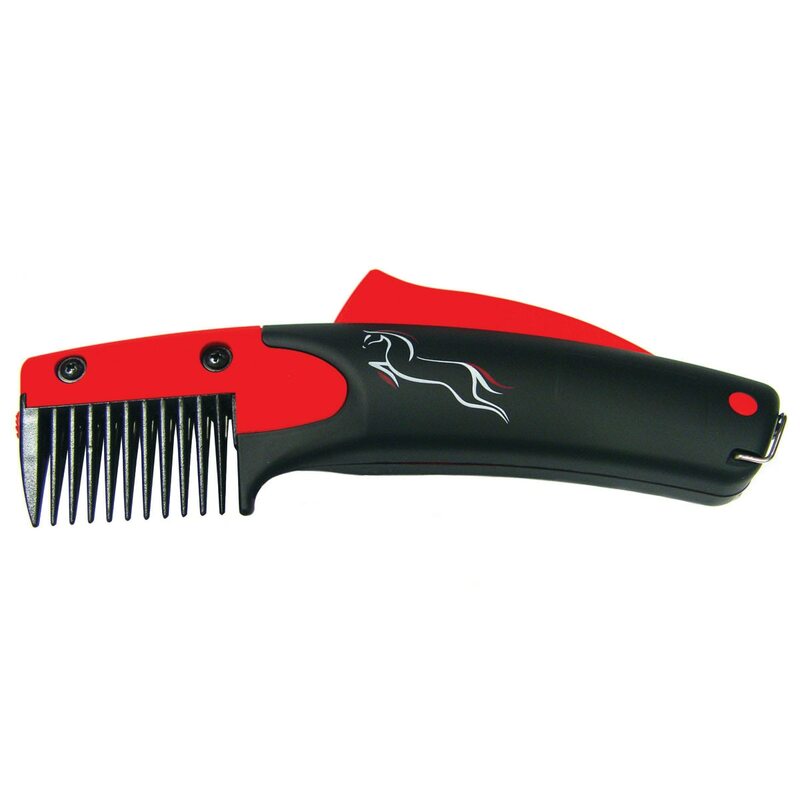 The SoloComb is an essential item for a tidy mane and tail. Create a natural look without the tedious job of pulling. Back comb the hair as usual and then instead of pulling the hair simply press the lever and the hair is instantly and painlessly clipped. High impact plastic SoloComb is extremely lightweight and easy to use. The SoloComb even works on the whiskers and is great for grooming dogs too! Start with a clean, tangle free mane and tail. It is recommended that you start at the withers and work your way up the mane. Then prepare the mane as you would with a pulling comb. Steps: 1. Back comb into the mane the holding the hair (under tension) with one hand, comb in the other and push top hairs back until the desired amount of under hairs to be removed is in the teeth of the comb. 2. At this point DO NOT PULL THE COMB DOWN; raise the hair held in your hand up into the blades so that the hair is under tension. Then press the lever down on the handle and the hair will be clipped. (For medium/thick manes go closer to the roots). 3. Comb out the tangles for the next cut. When the desired length is reached you may want to pinch or nip off ends of the hairs with your fingers to complete the look. Cleaning the comb: 1. Remove the two fixing screws and lift off the blade cover. 2. Remove the blade fixing. 3. Lift blades off the mounting pins and clean off debris. 4. Separate blades and rinse with water. 5. Dry with cloth and spray sparingly with WB40. To replace the blades: 1. Follow steps 1 & 2 under cleaning instructions. 2. Lift blades off mounting pins. 3. Insert new blades. 4. Replace blade fixing plate. 5. Replace blade cover and screws. Natural ingredients like marigold, carrot and St. John‘s wort regenerate and restore damaged skin areas and stimulate hair growth on bald spots. Bio-sulphurous fluid soothes bothersome itching and rubbing tendencies with lasting effect. Made In Germany. SoloComb is rated 4.3 out of 5 by 162. Rated 1 out of 5 by Am78 from Loved it at first! I loved this product when I started on my geldings mane. About halfway through the comb popped out and wouldn't stay in place. 3/4 of the way, the blade dulled so I couldn't finish. I am disappointed because I really loved it! Rated 2 out of 5 by Takinupspace from Worked well until it broke I was excited to use this tool as an alternative to mane pulling and it worked great at first, but halfway through the mane the cutting part stopped working. It's almost like the bit that holds the button to the blade broke or something, but now it's just a normal comb...definitely disappointed for the price. Rated 5 out of 5 by mgwiels from my favorite product the SoloComb is so easy and quick. i pulled my horse's mane in 10 minutes because it's so easy and doesn't make your hands cramp either like normal pulling does! Rated 5 out of 5 by OTTBlue from Made mane management easy I was tasked to get a haflinger ready to show and sell. Between this and the solorake the cleaned up real nice. Simple to use and great for a horse with a double mane that had never been put through the show cleaning rigmarole. Rated 5 out of 5 by Brown eyed girl from Great time saver Saves time on my mares thick mane. It takes a little to get used to, but worth it. Rated 5 out of 5 by Ascan from Brand new SoloComb!!!! I bought this new SOLOCOMB to replace my old one. After several years , it needed to be retired, and now my mare will look fabulous with her newly trimmed mane. All ready for spring! Rated 5 out of 5 by Eventer753 from My Horse loves it!!! I bought this to try and find an easier way to pull my horse's mane. Rated 5 out of 5 by boesmad21 from Amazing for sensitive horses and thin manes!! I bought this comb about a year ago and it still works amazing. My pony usually rears up and hates having her mane pulled, but will fall asleep when i use this comb. Also great for thin manes because you can choose how much to cut.